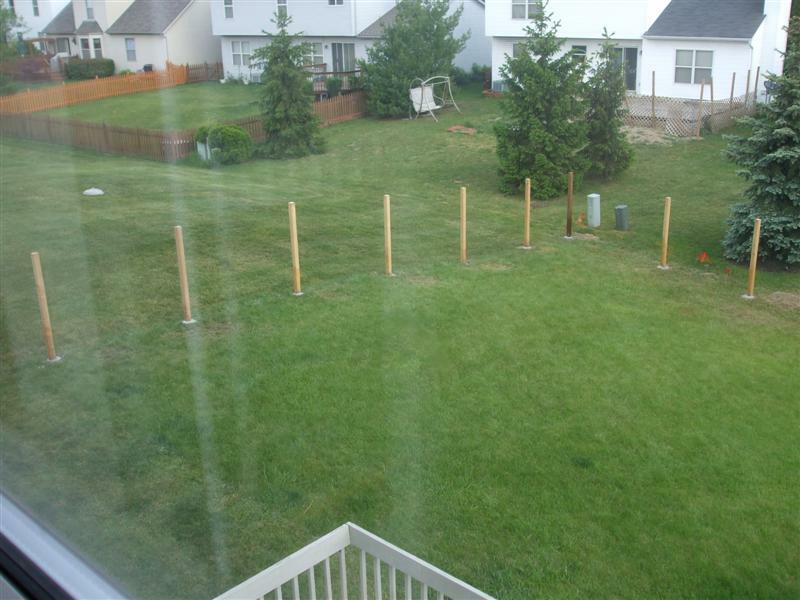 Last week Heather and I received our Federal tax incentive check and decided to go ahead with getting a fence for the backyard. We wanted a dog eared 4′ wood fence to match our neighbors which we plan to connect our fence to. So here’s the story. We got a quote from Lowes a little over a month ago to have the fence installed. They quoted us about $1,200 for treated pine lumber plus labor, roughly $2,500. So moving forward with the idea that materials would be about $1,200, we decided to install the fence ourselves. As the process moved forward, I did some research on some home improvement web sites and found that the treated pine tended to warp, split, crack, etc.. over time. From observing our 15 year old treated pine deck, I do believe these home improvement web sites are right. So I decided to go with red cedar since it has a better reputation for holding up with minimal shrinking, cracking, cracking, etc… So now the material expenses are up near $1,600. We wanted to match our neighbors fence as closely as possible. 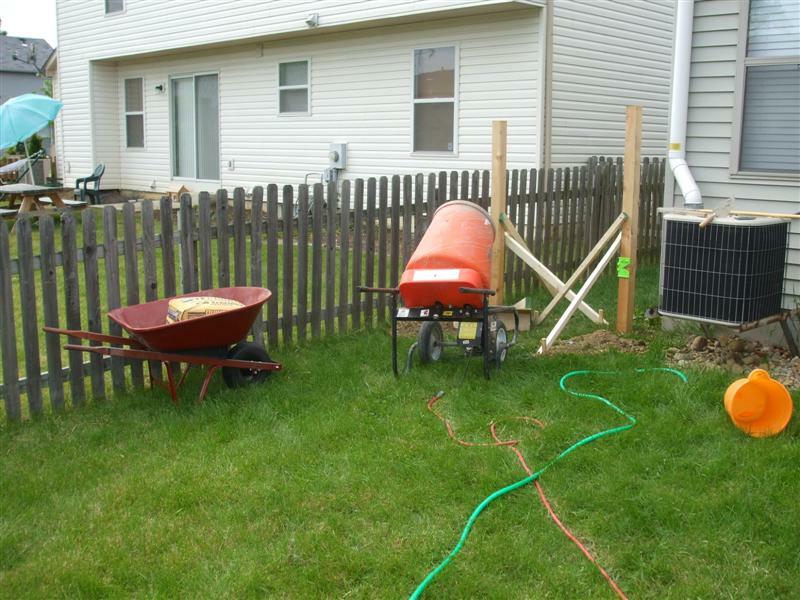 Both Home Depot and Lowes only sell 6″ dog ear pickets, which doesn’t match our neighbors 4″. After making some calls, I was recommended to call Sutherlands. After a quick call with them, I found that all for the materials for the project were priced competitively and they have 4″ red cedar dog ear pickets too. So I ordered all the materials on Wednesday, everything arrived that Friday. The first step in installing the fence was to dig the post holes. 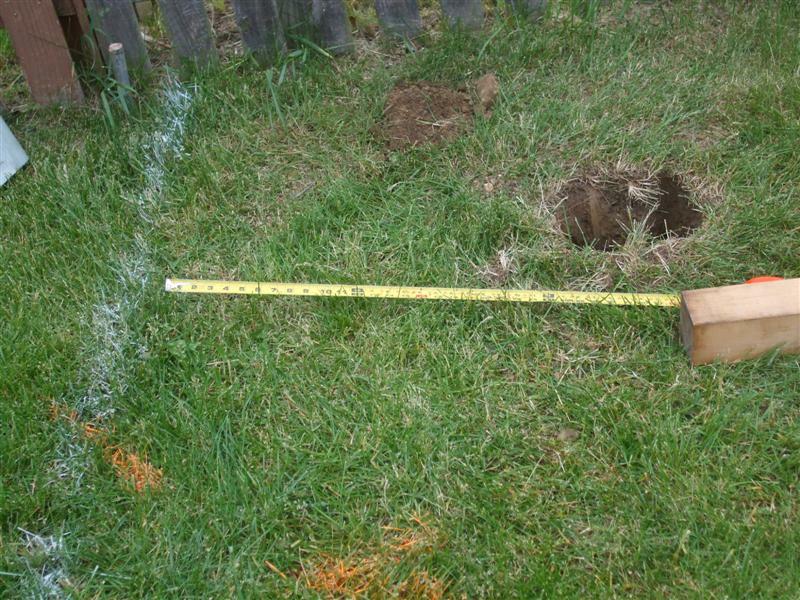 I called 811 on Wednesday afternoon to get the utilities marked in the back yard. On Friday, I rented an auger from Home Depot with a 10″ bit to drill 10-12″ post holes. 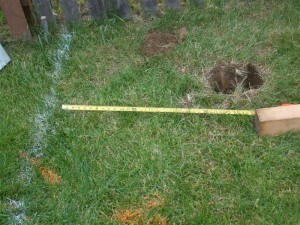 It took my brother-n-law and I about an hour to drill one 30″ hole with the 10″ bit. We kept hitting rocks in the ground which made the process take a lot longer than it otherwise would have. The whole was between 12-15″ wide. We decided to get a 6″ bit for the auger after starting hole number 2. An hour later, we got the smaller bit in, and started drilling the holes faster, though by hole 4, we didn’t just have rocks to deal with. We hit an unmarked coax cable in the ground. After further examining ,we determined the cable was for Time Warner Cable to my house. I’m currently a WOW customer, so we decided to just keep going on our path. We then started drilling our holes across the back of the property. This is where the real fun started. At our 4th of 9 holes, we hit the main WOW cable. It was marked about 2 feet from where the cable was actually in the ground! Needless to say, we knocked out cable service for the rest of the neighborhood. In the process of waiting for WOW to come fix their cable, we started remarking the fence 3 feet from the back of the property line since we no longer trusted the markings. As the WOW repairmen came to fix the line, we started drilling our remaining posts on the new 3 foot back line. Just as the WOW folks left, we were finishing the last hole and discovered their line again. This time, we were 5 feet away from the closest marking on the ground. luckily we caught it before the auger tore through the cable. The rest of the weekend Heather’s dad, my dad set posts and mixed concrete. On Sunday we only got 2 posts completed mixing the concrete by hand. On Monday, we rented a concrete mixer, thankfully Home Depot Rents was open that day! If you have more than 4 bags of Quikrete to mix, I highly suggest renting a mixer. It cost about $45 and was worth every penny. On Monday, Heather’s dad and I got the remaining posts set and concrete poured, except for the remaining hole where we discovered the WOW cable a second time. 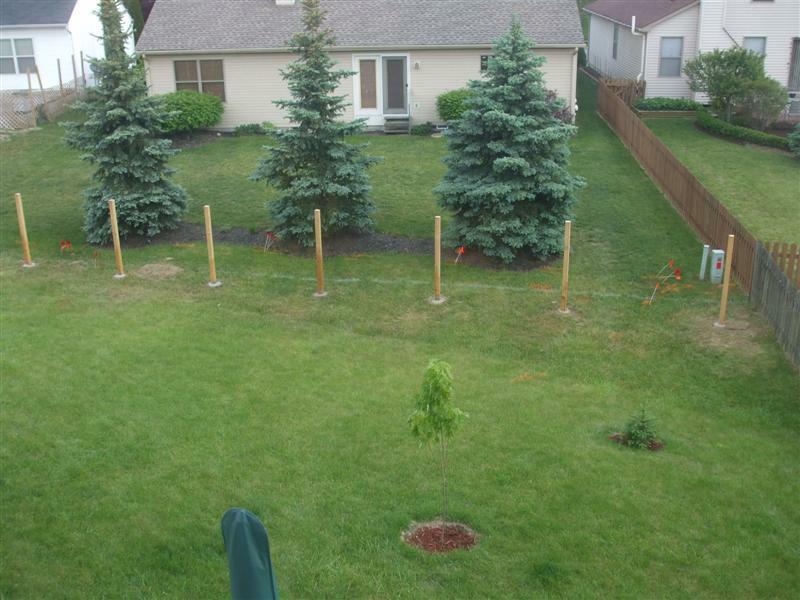 Heather’s dad did a great job setting the posts, they are very level and plumb with each other. On Tuesday afternoon, the WOW folks returned, tested their line and decided to replace the portion of the line where I found their main cable. Once the guy left, I hand digged another foot beyond the cable line to reach 30″ for the last post. This manual digging was a pain and I believe resulted in seriously hurting my back. Then I plumbed up the post, mixed the concrete and set the post just before the sun came down. On Wednesday, I returned the extra materials (3 posts, 8 bags gravel, 4 bags Quickrete) I purchased as well as exchanged 20+ pickets that I discovered were damaged from the original delivery. That evening, Heather and I returned the truck (we’re on our own now). This morning I did some clean up and removed the remaining braces holding up the posts. Phase 1 complete! 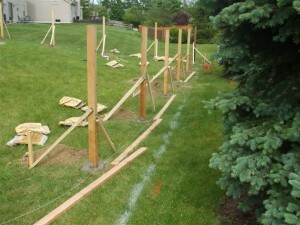 Next weekend my dad and I will be working on phase 2, which includes installing the runners and the pickets. Dad has a pretty nice wireless drill, so this process should go rather quickly. The red cedar pickets are rather fragile though, I am planning on pre-drilling the holes for the screws, but besides that the picket installation should go as quick as any other picket fence. I’m never installing a fence myself again. 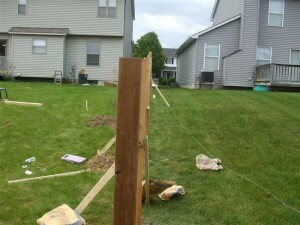 Installing a fence is a lot of work and full of obstacles that cannot be foreseen. Looking back, it may have been worth $2,500 to have someone else do it, though I will have to say that I don’t think the installers would have put this much care for quality as we are. The fence is complete. Read more. 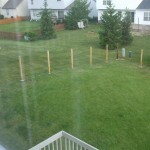 3 comments on "Fence for Dog – Phase 1 Complete"
After reading your story and hearing my cousin’s I’m extremely greatful for moving into a house with a pre-existing fence. I’m sure your dog will be quite happy! Stop crying you baby. 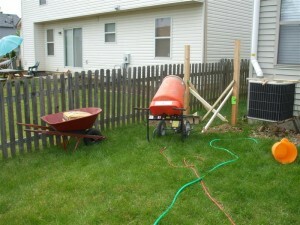 I did the same size fence with a posthole digger. 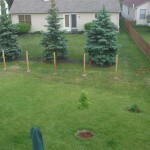 Set all of my posts in concrete in one night with the help of a 70 year old in-law. We didn’t even use a mixer as they are unnecessary. BTW – I assure you that you would not want to see the type of job you would get by paying only $2,500 for a fence that size. I will admit, if I had to do it again i would not bother with one of those gas augers and just dig the holes with a post hole digger.